This article appeared in the May 2011 issue of Professional Artist. Click here to download or purchase other archive issues. Landing exhibition opportunities in nonprofit galleries is essential for emerging artists who wish to build a national exhibition trajectory. Exhibiting at nonprofit galleries can help one transition from showing a few pieces in numerous juried group shows to presenting larger bodies of work or experimental projects in solo shows, taking one’s career to “the next level” and leading to future opportunities. Nonprofit galleries are located throughout the nation, offer various levels of support and differ in their mission statements. While some galleries may be media specific, others accept interdisciplinary proposals and site-specific installation work. Unlike commercial galleries, nonprofit galleries do not depend on sales to stay in business; therefore, many support edgier art, alternative art and work by emerging artists. Nonprofits also take a smaller percentage of sales — generally 30 percent. Because of their funding status, nonprofits can also provide support through in-kind donations, sponsored exhibitions and artist grants to help cover the costs of producing, exhibiting, marketing and promoting new work. 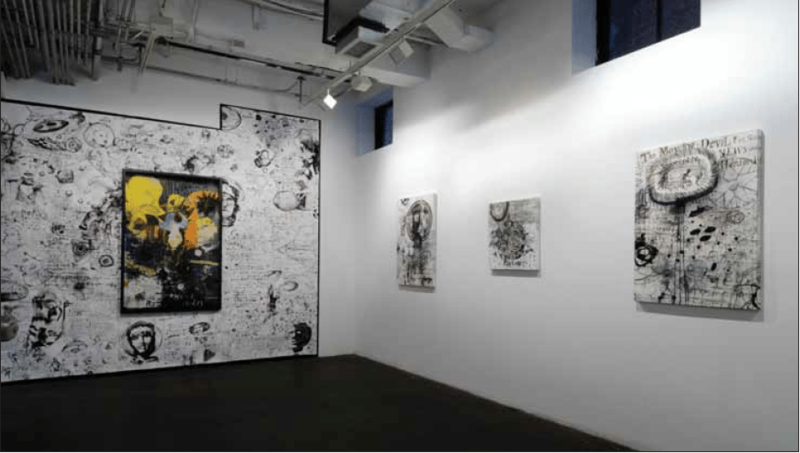 Exhibiting in nonprofit galleries allows artists to form relationships with staff members, curators and the board of directors, helping artists form a base and network of support to follow them throughout their careers. Nonprofits also come with a supportive collector base, arts patrons and arts professionals who have a vested interest in discovering new work. This article is intended to help you get started with researching national nonprofit galleries, and preparing and submitting exhibition proposals. Researching the national art market will help you place your work in a larger context. Like it or not, the art world is a tiered system. While you may be in the position of starting out locally or regionally, you will be expected to exhibit nationally if you wish to take your career to the next level. Doing your homework can help you place your work in the larger arena and develop your national exhibition trajectory. The Art in America Annual Guide to Galleries, Museums, and Artists, published each fall, is the authoritative guide to the national art market. It features a directory of nonprofit galleries, alternative spaces, commercial galleries, museums and university galleries identified by region and state. The Guide is included for free with a subscription to Art in America magazine, although an online version of the directory is scheduled to be published on the magazine’s Web site this September. Be strategic in your research. Decide which geographic region you would like to target; this will help define where you want to show. Is there a particular city in which you would like to exhibit? Which market are you trying to reach? Exhibiting at national non- profit galleries is also a great way to introduce your work to commercial gallery directors, museum curators, collectors and artists in specific regions. Visit the Web sites of nonprofit institutions in your target area and see if your work would be a good fit. Once you define your location, consider extending your research outside the perimeter of the target city or town. For example, if you want to reach the southeast market and exhibit in Miami, consider researching the larger market of South Florida — St. Petersburg, Ft. Lauderdale, Palm Beach, etc. Expanding your search will broaden your chances. After you narrow down your search, visit the institutions’ Web sites to see submission policies, guidelines on submitting proposals and application directions. Some spaces may have an open submission policy throughout the year, while others meet once or twice annually to review proposals. Some application deadlines come with a curatorial theme or concept specific to the call for entry, while others accept open proposals. Most nonprofit galleries rely on a panel of outside jurors consisting of arts professionals, curators, dealers, artists and art educators. Often, it takes several times of applying before your work is accepted to any venue. Do not give up after the first time applying. Persistence and tenacity are the keys to survival in the art world. Develop a thick skin, and do not take rejection personally. All artists deal with rejection. Learn how to move beyond rejection and not allow it to dampen your creativity and productivity. You will be rewarded for persistence and determination in the long run. Also, do not put “all your eggs in one basket.” Apply to many venues; cast a wide net, strength in numbers. Regardless of your application’s final status, having your work in front of a panel of jurors is worth the price of application alone; think of it as a free review. Review panels have a vested interest in discovering new work. While your application may not be accepted the first time you apply, you will have had the opportunity to have your work reviewed by national arts professionals. In addition to exhibiting work, many nonprofit galleries maintain online slide registries and publish a member’s directory featuring artist bios, statements and images of artwork. This is a great resource for national curators and gallery directors seeking new work and an easy way to increase your visibility on a larger scale reaching a new audience. Read submission guidelines carefully. Submit no more and no less than what is required. Research the Web site extensively. You will be asked why you want to exhibit in that space, why now and how you will benefit from this exhibition opportunity. These questions can be addressed in your cover letter or statement. The cover letter should be clearly formatted in proper style and should target your audience and reader. Be mindful of the tone in your cover letter; keep it short, sweet and positive. Manners go a long way; make sure to thank the panel for their time and consideration. Your name, address and contact information should be easily located on every sheet of paper within your application. Keep font size at 12 points, no smaller. A curriculum vitae, or c.v., is an artist’s resume and highlights one’s background in the following categories: education, professional experience, exhibition history, visiting artist lectures, awards/fellowships/ grants, artist residencies, grants/commissions, private/public collections, and bibliography of exhibition catalogs, special mentions in the press and art reviews. A c.v. may also include jobs, internships or volunteer opportunities, since it pertains to your career. It should be clearly formatted and easy to read. Don’t feel the need to embellish with fancy fonts or crazy colors. Keep it simple, and follow the same organization pattern throughout the c.v. in reverse chronological order with most recent first. Spell check, and have a friend/colleague/loved one proofread. An outside reader will easily pick up mistakes and misspellings. Be honest; do not exaggerate or “pad” the resume. It’s okay to not have a ton of experience at this stage in the game. An artist statement gives the panel an opportunity to understand your work. Writing an artist statement can be a daunting task for many artists. However, a statement helps to clarify your intentions and motivations, and gives you the opportunity to communicate to the viewer about your work and creative process in your own words. The best artist statements are written by the artist, in a straightforward manner, and in the artist’s “authentic” voice. Artist statements are introductions to your work. Keep in mind your audience, purpose and motivation. What is your background? What about your methods or materials? What are some of the issues or concerns in your work? Don’t feel pressed to sound like an art critic or literary theorist. Avoid heavy jargon, and communicate in your own style. Keep the writing visual. This will help the reader get an idea of your work. Most importantly, write in a clear language that anyone could understand. An artist statement should clearly and effectively communicate about your work in your absence. Keep it short and relevant — a few paragraphs will do. Avoid repetition and lengthy explanations; members of the review panel will not have a lot of time to read. An artist bio is a brief overview of your history, educational background, work and exhibition record, usually about two paragraphs. It is the cliffs notes version of your c.v. and artist statement. Before writing your bio, read the bios of some of your favorite artists; you can locate them on their Web sites. Many galleries use artist bios as an abbreviated introduction to the artists represented. A project proposal is a written statement that clearly outlines your exhibition plan. It lays out the scope of what you plan to show, the scale/overview of the project and installation details/requirements. A project proposal is generally one to two pages, typed and double-spaced. It also helps to visually show the panel a “maquette,” or visual diagram, of your exhibition plan. Most panels require electronic work samples on CD or uploaded through the application Web site. Work samples can make or break your application. If you do not have access to proper lighting and camera equipment, hire a professional photographer to document your work. In addition to having great work samples, consider how your edit and sequence images. Work samples should be tailored to your application and represent your best work and from the same series. If you work in installation or in 3-D, it is acceptable to include more than one view of the work. Create an image list to correspond with work samples, identifying your name, year, title of work and media for each work. This will allow the viewer to quickly address questions of scale, media and titles. Keep file-naming conventions simple (i.e. lastname_ 01.jpg, lastname_02.jpg) and follow preferred file format guidelines. If no guidelines are given, resize files to 800 pixels on their longest dimensions and 72 PPI. This will prevent long download times, and will enable the images to fit well on most desktop and laptop screens. E. Brady Robinson is Associate Professor in the School of Visual Arts and Design at University of Central Florida, Orlando. She received her B.F.A. in Photography from The Maryland Institute, College of Art, and her M.F.A. in photography from Cranbrook Academy of Art. New work will be featured in a solo exhibit this May at Cornell Museum of Fine Arts in Winter Park, Florida. Visit her Web site at ebradyrobinson.com.